Two men who were nabbed at a city hospital after the execution-style killing of a security guard in front of his wife and his five-year-old daughter were this morning charged and remanded to prison. However, only one of the men appeared in court for the charge to be read to him. His co-accused is still hospitalised and nursing a broken left leg. Roderick Thomas, 28, of Kitty, Georgetown had to be assisted by two police ranks into Chief Magistrate Ann McLennan’s courtroom. His left leg is broken due to a gunshot wound. 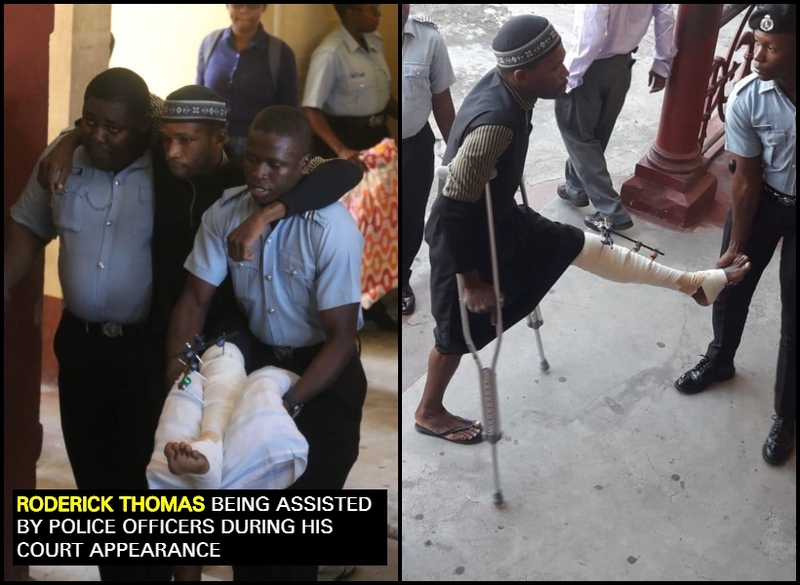 While in court, Thomas was placed to sit on a chair while his left leg was placed on another one for support. Soon after the Magistrate exited her chambers and read the murder charge to him. Thomas, who the court heard is a private security guard, was not required to plead to the indictable charge which stated that while being in the company of Devon Allen on January 22, 2019, at Eccles, Public Road, East Bank Demerara, he murdered Kelvin Walters. His lawyer, James Bond, told the court that his client was discharged from the hospital yesterday after undergoing multiple surgeries. The lawyer added that his client was at the hospital after he was involved in a mining accident and has no knowledge of any murder. He went on to ask the court for his client to be remanded to the hospital and not the prison. In his reasons, he cited the risk of his client being infected since the prison population is high. However, Police Prosecutor Neville Jeffers, told the court that the number one defendant, Allen is still hospitalised and will be appearing in court next week for the charge to be read to him. The Magistrate after listening to the Prosecutor remanded Thomas to prison. The matter was adjourned until February 15, 2019 for reports. According to information, the execution style killing of Walters is link to an ongoing trial in the high court involving three men who have been accused of throwing a live grenade at a vehicle owned by Glenn Lall, owner of Kaieteur News in 2017. It was reported that both Thomas and the pillion rider, Allen, fell off their motorcycle and were injured. They were forced to escape on foot. Both suffered injuries consistent with that of an accident. CCTV footage showed one of the gunmen hopping north along the East Bank Demerara Public Road. Walters was on his way up the East Bank Demerara Road when the two men on a motorcycle pulled up alongside him and opened fire. After the victim was shot, he managed to slam his vehicle into the suspects, causing both of them to be injured. At the time of the shooting, the victim’s wife and child were in the vehicle but escaped unhurt. It is unclear if they saw the faces of the suspects. For the grenade attack on Kaieteur News, Alfie Garraway, Janeil Howard, and Leroy Williams are before the court. It was Walters’ testimony that landed the men behind bars for the attack.